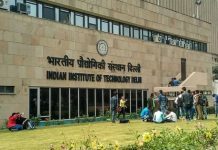 New Delhi: Government has approved setting up of 9 Research Parks one each at IIT Madras, IIT Kharagpur, IIT Bombay, IIT Gandhinagar, IIT Delhi, IIT Guwahati, IIT Kanpur, IIT Hyderabad, and IISc Bangalore. IIT Madras Research Park, which is fully functional with 43 R&D clients, 4 Incubators, 55 Startups, and 5 Centres of Excellence was established at a total cost of Rs. 447.66 crore, which includes grants-in-aid of Rs.137 crore from the Government. The Research parks at IIT Kharagpur and IIT Bombay are under construction at a cost of Rs.100 crore each, out of which a sum of Rs.100 crore has been released to IIT Kharagpur and Rs.33 crore to IIT Bombay. IIT Gandhinagar Research Park currently under construction has been approved at a cost of Rs.90 crore with full funding from the Department of Science & Technology, which has released a sum of Rs.40 crore as on date. Remaining five new Research Parks have been approved recently at a cost of Rs.75 crore each, out of which, a sum of Rs.5 crore each has been released.